This is a reference post about a recent series of blog posts that illustrated how poorly climate models simulate Earth’s climate. I’ve also added a few other examples in this post. Climate Models are NOT Simulating Earth’s Climate – Part 1, which illustrated and discussed how climate models fail to simulate the spatial patterns of warming and cooling of the surfaces of the global oceans over the past 3+ decades and why they should be capable of simulating them. Climate Models are NOT Simulating Earth’s Climate – Part 2. It presented time series graphs of sea surface temperatures (not anomalies) globally and on hemispheric and individual ocean-basin bases, from 1982 to 2015, showing that climate models fail to properly simulate the warming rates (far too much warming in most cases) and fail to properly simulate the actual temperatures of the surfaces of Earth’s oceans. 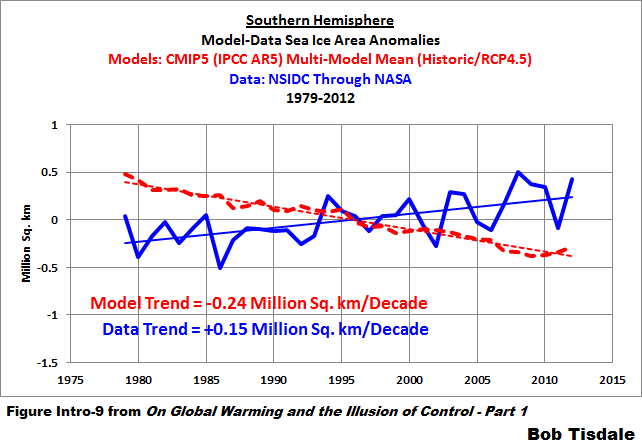 Climate Models are NOT Simulating Earth’s Climate – Part 3. This post illustrated and discussed how climate models, excluding the outliers presented in the post, show way too much ocean heat accumulation since 1955. This strongly suggests that most climate models are far too sensitive to manmade greenhouse gases. Climate Models are NOT Simulating Earth’s Climate – Part 4. It presented climate model simulations of the energy imbalance at the top of the atmosphere, which is a variable crucial to the hypothesis of human-induced global warming. In that post we used the 8 outlying climate models from Part 3. The alternate title for that post: Climate Models Undermine the Hypothesis of Human-Induced Global Warming. As shown quite plainly in that series, there are few similarities between reality and climate models. Other examples are hemispheric sea ice. For this, I’ve included 2 model-data comparisons from the Introduction of my ebook On Global Warming and the Illusion of Control – Part 1. For the Arctic, the most recent generation of climate models underestimates sea ice losses. See Figure 1. This has been a problem for multiple generations of climate models, not just the most recent generation. And the problem is widely known and commonly spun. That is, quite humorously, alarmists hype the additional losses in Arctic sea ice, claiming “worse than predicted”, when, in reality, they’re highlighting one of numerous failings of climate models. The problem for the models is reversed at the other end of the globe, in the Southern Ocean surrounding Antarctica. Refer to Figure 2. There are sea ice gains in the Southern Hemisphere, while the groupthink (consensus) of climate modeling groups indicate there should be sea ice losses. 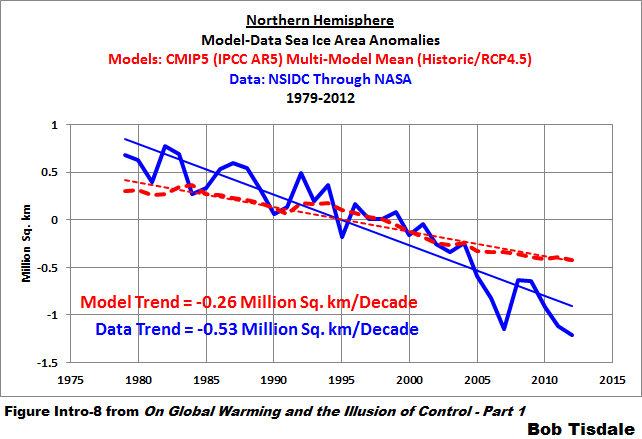 The sea ice gains in the Southern Hemisphere still confound climate scientists. GPCP v2.2 – NASA’s Global Precipitation Climatology Project Version 2.2 (also supported by other groups around the globe) – Ends February 2015 at KNMI Climate Explorer. 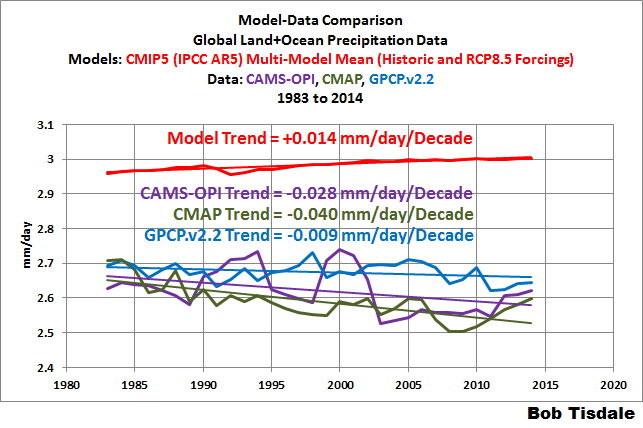 The consensus of the climate models show global precipitation increasing slightly from 1983 to 2014, while all three datasets show it declining. But, as I discussed in the Introduction to my ebook On Global Warming and the Illusion of Control – Part 1: The biggest disparity, however, is in the amount of precipitation shown in the models. The average of the models (the consensus, a.k.a. groupthink) are generating more than 10% too much precipitation. That might not sound like a lot, but, according to the modeled worst-case scenario, global precipitation is only supposed to increase about 7% by the end of the 21st Century. In other words, the difference between the modeled and observed global precipitation in recent decades is greater than the expected worst-case increase by 2100. And as I further noted, Figure 3 also suggests something else: there may be too much water vapor in the climate models’ virtual atmospheres. Water vapor is a greenhouse gas. The higher the water vapor, the greater the warming in the models. Climate model-based studies are conjectural at best, misleading at other times. Bob. Here is a link to my recent Gust Post on WUWT which discusses the uselessness of the GCMs in the climate wars. Pingback: Why are U.S. Taxpayers Supporting Numerous Duplications of Effort in the US Global Change Research Program (USGCRP)? | Watts Up With That?